Enjoy a sneak preview of the newest Wolverine State Brewing Co. beers before they hit the shelf! Unwind with friends in the spacious Hyatt Place Ann Arbor lounge while playing with adorable (and adoptable!) pups, and while enjoying appetizers and craft beers. Play time with puppies from The Devoted Barn and the opportunity to adopt one! Ticket proceeds benefit The Devoted Barn of Newport, MI. Get yours today! It's hard to put into words just how much Brewmaster Oliver Roberts has meant to us here at Wolverine State Brewing Co. over the years. That's why we won't even try to do that here, instead come help us celebrate Saturday, March 9th as we collectively wish him fare well. Beer and food are two of the most incredible parts of life when enjoyed separately, but imagine when they are allowed to work together! All foodies and craft beer aficionados are invited to join us this spring for a Beer and Food Pairing Event in Zehnder’s Tap Room on Thursday, March 7, 2019 starting at 5:30 p.m. The event begins with hors d’oeuvres and cocktails from 5:30 to 6:30 p.m. Afterwards, enjoy a six-course spring themed dinner featuring a unique dish created by Zehnder’s professional chefs paired with a complementary craft beer to enhance your palate. Dave Newstead from Wolverine State Brewery will be here to discuss how the pairings were decided and answer questions about their beers and the brewing process. It’s that time of year again! 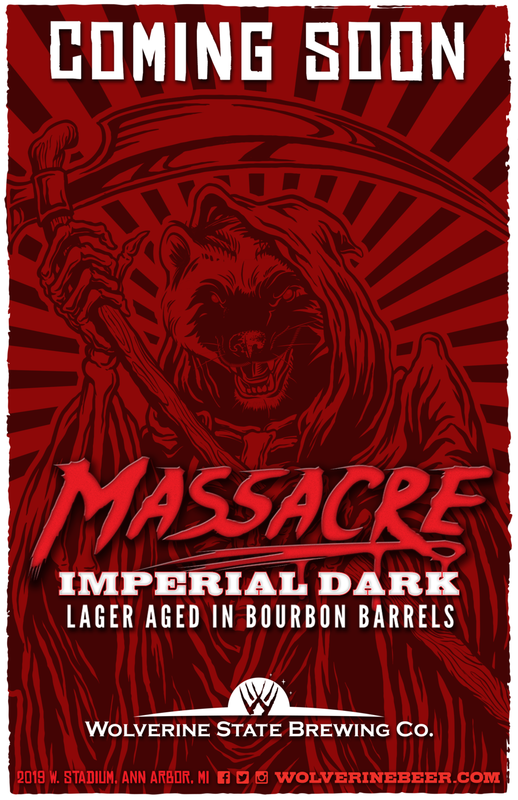 This year help us celebrate the release of one of Michigan’s best bourbon barrel aged beers, Massacre, as we throw a bash at the brewery. At Wolverine State Brewing Co. we take great pride in bringing out what we consider the best Oktoberfest style brew around. This year we wanted to kick it up another notch and we thought that the best way to do that was to let you take that Oktoberfest greatness home to share with friends and family in an entirely new way, 16 oz cans! For ONE DAY ONLY, you can find our 2018 Oktoberfest in house, prepackaged in killer 16oz - 4 Packs ready to roll out our front door and into yours! Also kicking off the festivities will be food specials, music and traditional Bavarian games. This always anticipated release from Michigan’s only all-lager brewery is characterized by toasted bread crust notes, uncanningly clean flavors, and finished off with a mild toffee sweetness. German Noble hops balance out this elegant, malty brew, leaving you refreshed and clamoring for your next sip as you enjoy the change from Michigan Summer to Michigan Fall. Join us for a tasting of our flagships and some fun draft stuff at Blue Front in Ann Arbor! Each and every month we take over the taps at the Hyatt Place in Ann Arbor, showcasing a rotating selection of some of our favorite, most unique and fun beers. Join us for the Battle of the Breweries that is taking place at the Fun Town Chowdown Food Truck Festival! This event takes place at Frankenmuth River Place Shops from 3-9 p.m. Two craft breweries will battle it out for the champ title based on which has the most sales for the festival. That brewery will then be invited back next month to defend its title! After winning the first month against Ellison Brewery & Spirits, this month we take on Grand Armory Brewing! Join us as we take over the taps at Frankenmuth's premier wine and charcuterie bar! The Williamston International Festival of Lagers! Over 30 lagercentric breweries from around the world will be in attendance. Food Trucks will be present to help you lay down a base. Music will be in the band shell to keep your spirits high! Join us at Club House BFD to consumer your favorite WSBC beers while we consume their tap system with all of our lagers! Join us at Monelli's for a tap takeover featuring your favorite Wolverine brews! Join us for a multiple course dinner with each round paired perfectly with your favorite WSBC lager. Ann Arbor is home to a delightfully diverse and equally enjoyable beer scene, and here at Wolverine State Brewing Co. we take pride in being part of that ever evolving community. That community, which reaches beyond the walls of your favorite brewery and into your favorite local dining spot, beer hall and hopefully your fridge at home, is exactly why we felt the need to host a celebration. Our goal is simple. Harness that great communal aspect of craft beer, combine it with the spirit of the Ann Arbor community, and continue to build relationships, to share our knowledge and love of that binding liquid gold, and to lend a hand to a local cause in the process. That’s is why we teamed up with 6 of Ann Arbor’s favorite beer destinations to bring forth the WSBC - American Craft Beer Week Challenge. Here’s how it works. Two person teams from Zingerman's, The Session Room, Rappourt Brew and Chew, The Beer Grotto, Ashley’s and HopCat, have all been tasked with the idea of creating a concept for a beer. This concept can be based on a favorite beer or specific style, a favorite cereal, or just an idea purely from their imaginations. Each team will work with staff at the brewery to turn that concept into a recipe to be brewed on our pilot system. WSBC staff will then guide our new brewmasters through the process of beer creation from start to finish, providing insight and a helping hand, while encouraging each team to be as hands on as they can with their beer. After enjoying a flight, there will be a live voting portal at www.wolverinebeer.com/vote so that guests can rank their favorite new beers. Later in the evening, the top three places will be announced with the first place team taking home the WSBC - ACBWC trophy for the inaugural year. While day of supplies of each teams beer will be limited to the total volume of our pilot system, thanks to our friends at Adventures in Homebrewing, the complete kit (including recipes and step by step instructions) for each teams beer will be provided at a 10% discount to anyone who may have the urge to recreate one of the competition beers. Each year, beer weeks celebrate the culture and community of craft brewers across the U.S. The Brewers Association is happy to assemble American Craft Beer Week, each May. This celebration, coordinated by the Brewers Association’s Craft Beer Program, is an exciting opportunity for craft brewers to commemorate their art and tradition with enthusiasts across the country. The World Expo of Beer is a beer sampling extravaganza! If you love beer, you will love the World Expo of Beer, with over 300 brews to choose from. If you don’t love beer, but you love a good time, you will still love the World Expo of Beer. If you’ve attended before, skip reading this and order your tickets NOW!. If you haven’t, check out all the event has to offer and then mark your calendar and don’t miss it! With entertainment both nights, an expanded area to accommodate more beer enthusiasts, great local food, and best of all…this year we are going green and throwing in the sampling mug for FREE (with paid admission) to eliminate disposable cups! Prost! The World Expo of Beer takes place May 18th and 19th, 2018 in Frankenmuth, Michigan’s Heritage Park. Gates open at 5pm on Friday and close at 10pm. The festivities rev up again at 3pm Saturday until 10pm. Hosted by the Frankenmuth Jaycees, the World Expo of Beer is a stellar fundraiser for the community and proceeds are donated to charitable causes! Enjoy a sneak preview of the newest Wolverine State Brewing Co. beers before they hit the shelf! Unwind with friends in the spacious brand new Hyatt Place Ann Arbor lounge while playing with adorable (and adoptable!) pups, enjoy appetizers and craft beers. Ticket proceeds benefit The Devoted Barn animal shelter. Get yours today! Join us for the Battle of the Breweries that is taking place at the Fun Town Chowdown Food Truck Festival! This event takes place at Frankenmuth River Place Shops from 3-9 p.m. Two craft breweries will battle it out for the champ title based on which has the most sales for the festival. That brewery will then be invited back next month to defend its title! Pints & Poses is back: Add the "Spring" to your Step! Join us for an hour-long, all-levels Vinyasa flow & toast Spring with a great Wolverine Brew pint as a chaser. This event is fun, casual, and will give you a medium intensity workout. Appropriate for begininners & beyond. Tickets are $20 apiece and include the guided yoga session and a pint of your choice afterwards. Class is taught by Robin Schultz-Purves, owner of Yoga Rising and a local yoga instructor who has led every Pints & Poses class at Wolverine! These classes do sell out pretty quickly, so make sure to grab your tickets while they're available. Join us as we taste 6 years of Wolverine State Brewing Co.'s favorite Imperial Bourbon Barrel Aged Dark Lager! The space is beautiful. Clean cut and ripe with the smell of saw dust, but still warm and inviting. It’s elegant but not pretentious. It feels like the quintessential neighborhood shop from before the big box retail invasion. So what better place to host a WSBC tasting party! 3rd place and beyond- Beer Raffle! Each month enjoy a sneak preview of the newest Wolverine State Brewing Co. beers before they hit the shelf! Unwind with friends in the spacious brand new Hyatt Place Ann Arbor lounge while enjoying appetizers and craft beers. Wolverine State Brewing Co. will be in the bar from 6:00pm to 8:00pm for special 6-year (2012-2017) vertical tasting of their Imperial Dark Lager: Massacre! This is an incredible opportunity to meet with the brewery and experience how a beer changes over time. For $18, you'll receive six, 3oz pours -- 18oz total! Tickets are available on MeetUp. Space is limited to 20 people.